Greetings fellow Lions! Please be aware that the 2018 State Convention is quickly approaching, as are the deadlines for discounted hotel rates, meals, and tours. Please see the links below for some more State Convention Information! Greetings to all Clubs of District 14-T. This is an official “Call for Our District Convention” for 2018 as indicated in Article VI, Section 2 of our District Constitution & Bylaws as required by Lions Clubs International. 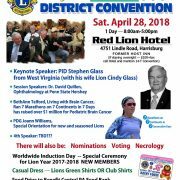 This year, the District 14-T Convention to be held Saturday, April 28, 2018 at the Red Lion Hotel beginning at 8:00 AM in the Capital Ballrooms-East and West and the Lancaster Room. The Red Lion Hotel is located at 4751 Lindle Road, Harrisburg, PA 17111. Along with information, fun, fellowship, and inspiration, we will be voting on our district candidates for offices of 2nd Vice District Governor, 1st Vice District Governor, and District Governor for Lions Year 2018-2019. You can find more detail on the Convention in our district newsletter. Please share this information with everyone in your clubs and plan on coming out to share in this one-day event with others from around the District. Should you have any questions about the Convention, please contact myself, or Convention Chair PDG Salli Miller. Also coming up is the 2018 State Convention which will be held from May 17th to the 20th at the Penn State Conference Center Hotel in State College.